Summary: In the early 60s a bunch of kids met playing in the extreme wilderness of New Zealand. The adventure they discovered in mother nature changed their lives – and the world. A 45 year quest for paradise and adrenaline told in stunning original footage. Extreme sports ‘doccos’ are a dime-a-dozen. It seems nearly every week our cinemas get a fresh batch of films showing people hurtling down mountainsides, surfing the waves or doing things even more extreme. However the weakness of these films is that they don’t show anything else, it’s usually just action shot after action shot with pumping music playing over the top. If you aren’t a surfer or a snowboarder then you can forget about getting anything deep out of the experience at all. That is where new ‘docco’ Last Paradise is very, very different. 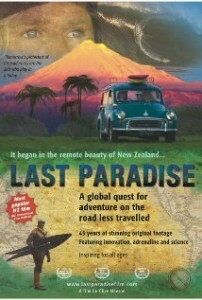 The film has been put together from footage shot by filmmaker Clive Neeson over the past 45 years of his life – during which time he has always been looking for the next adventure, which along the way has seen him and his friends create a lot of the different extreme sports that are the norm today. Neeson went from growing up in Africa where his parents worked as filmmakers capturing the wildlife of the continent. From there he went to New Zealand where kids didn’t have things such as televisions or video games, no they created their own fun. This saw Neeson and co coming up with things such as wake-boarding and bungee jumping, while also being some of the forefathers of extreme skiing and surfing. To his credit though Neeson has not just made this a vanity piece about himself, no he is a good enough filmmaker to go further than that. Using footage that has been restored by legendary director Peter Jackson’s visual team Neeson tells the story of how some of these sports were invented but also shows how our natural environment has also been put at risk for the younger generation, something his own family experienced when their home was hit by a tornado only a couple of years of ago… something that was virtually unexpected in Australia or New Zealand at the time. The footage that Neeson has been able to put together is absolutely amazing. From the early shots of wakeboarding to the beginning of the surf phenomenum in Australia right through to one of his crazy friends doing one of the first ever public bungee jumps – an illegal jump from the Eiffel Tower in Paris. Then there is also some great visuals of skiing on an active volcano and also shots of Surfers Paradise before anybody even knew it existed. It seems when it comes to extreme sports Neeson was there and caught everything on film. The science talk towards the end of the film does bog it down a little for ten to fifteen minutes but Neeson overcomes that with a strong finale that really exposes how urban development and environmental damage has ruined a lot of the areas that were playgrounds for him when he was growing up. Last Paradise is a good little docco that shows some of the never-before-seen stories of extreme sports. It’s well worth a look if this is a lifestyle that you enjoy.